Horse Lubber (Taeniopoda eques) grasshoppers are found in the southwestern United States and in Mexico. 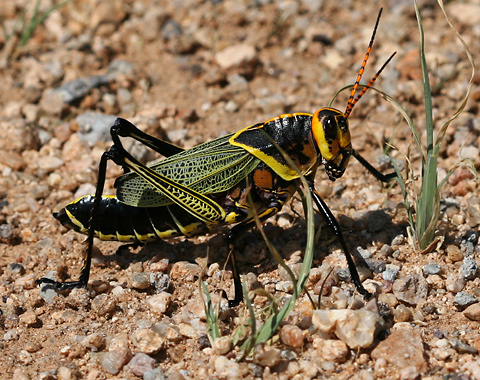 These large, distinctive looking grasshoppers are common here in the Sonoran Desert, especially in the late summer when the monsoon rains have transformed the deserts and grasslands to green with summer annuals and grasses. I spotted a vast horde of Horse Lubber grasshoppers crossing the road to Madera Canyon, Arizona in early September of 2007. The several mile-wide swarm of Horse Lubbers was moving southward through a more dry and barren desert area towards the lusher, green grasslands at the northern base of the Santa Rita Mountains. I'm not sure how Horse Lubbers got their common name, but their head does look a bit horse-like when seen from the side. Horse Lubbers are large, up to 2 1/2 inches (6.4 cm) long and are a shiny black color with bright orange to yellow markings, yellow-veined forewings that appear greenish at a distance, black and yellow to orange-banded antennae, and black-bordered red wings that are used in a threat display to potential predators. Unlike the flightless females, the males have larger wings and are able to fly. 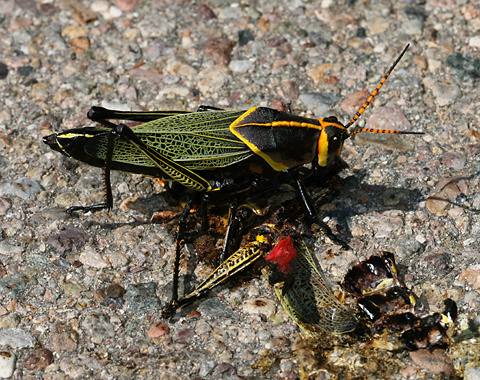 The black, red, and orange to yellow colors of Horse Lubbers are a form of aposematic (warning) coloration that indicates to predators with good color vision like birds that these foul-tasting grasshoppers are not good to eat. Horse Lubber grasshoppers themselves feed mainly on a wide variety of desert and grassland plants, but they are also opportunistic carnivores and carrion-eaters, and despite their own foul taste, Horse Lubbers will happily engage in a little cannibalism. Many of the swarming Horse Lubbers had been crushed by passing cars as they crossed the road to Madera Canyon, and the surviving Horse Lubbers took this opportunity to feast upon their fallen kin, only to later be crushed by cars themselves and then feasted upon by the next wave of hungry Horse Lubbers.